Where you and your children learn to love music together! We use the acclaimed Music for Young Children program, which helps children develop solid music foundations. Our curriculum includes Sunshine (ages 3-4) and Sunbeam (ages 5-6). MYC's method is built on learning through play and engaging the four learning styles. We believe that appropriate music education is interactive and fun for both the child and the parent, encouraging the desire for learning and long-term involvement in music. Sunshine is a keyboard program for ages 3-4 and the starting point of the MYC® Method, building their foundation in music reading and playing the piano. Students experience movement through beats and rhythms, as well as developing their fine motor skills with rhythm instrument ensemble playing. Children start learning the geography of the piano and note-reading through our MYC Critters (and their stories that children can relate to). By the end of the Sunshine program (after 36 weeks), children are able to play their first scale (C Major) and are reading from the staff. Their pre-reading experiences such as identifying like/different sorting, patterns, and reinforcing and recalling the music concepts through fun at-home activities with gluing and coloring are all part of this level. Once a child has finished Sunshine, they are ready to move onto Sunbeam. Moving to staff reading. Sunbeam are reading on the staff as of week 11 vs. week 18 in Sunshine. At Sunshine's age, students require a lot of reinforcement on the concepts to build a strong foundation. When they transfer to Sunbeam, they will review all the keyboard critters with the older students and move on to staff reading! Fall 2019 Class Schedule! Classes are starting on August 24! You may still enroll until September 21! Sunbeams is the entry point of the MYC® Method for ages 5-6. 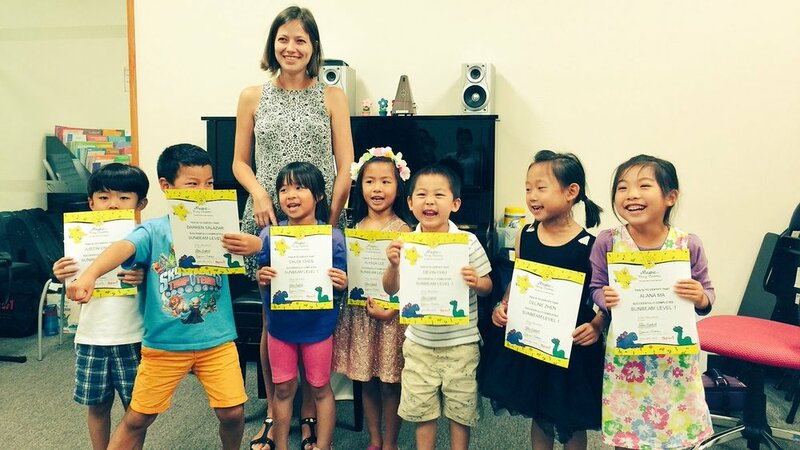 They are first introduced to piano geography and rhythms through our MYC Critters to help set their foundation of music knowledge and education; however, the pace of learning for these Sunbeams matches their developmental stages. Vocabulary development is the focus for this age group- at this stage we introduce “big kid” terminology to introduce concepts, finger numbers, and keyboard geography. Once a child has finished Sunbeam, they are ready to move onto Private Lesson. Development of ear training and sight-singing through the use of solfege is an integral part of the program. Songs are also used for expressive singing and to reinforce dynamics and the teaching of concepts. Developmentally appropriate written materials are provided for each level as confirmation and review of rudiments and theory. Homework for the youngest learner might be a gluing and coloring task while the Sunbeams' work may include theory pages reinforcing what has been reviewed in class. The keyboard geography begins in a D-centered approach. Keyboard reading skills are developed through careful incremental introduction of note reading with constant review to motivate and confirm for the child his/her own developing sight-playing skills. A composition unit of study is included in each level of MYC. However simple or elaborate in construction, each composition is reviewed and the student's effort is appropriately rewarded and encouraged. Creativity and expression are nourished. Program materials are specially designed and produced for the child's age and development. The text is beautifully and cheerfully illustrated and exciting for the young child. Each text provides: singing, warm-ups, keyboard, listening, rhythm and keyboard ensembles, and home assignment sections. In addition to the comprehensive student manual, the student receives a carrying bag, a magnetic board with grand staff on one side and keyboard on the other, magnets, and a parent guide. Parent participation in the studio is integral to the MYC program. By being present, parents become aware of their child's learning styles, strengths, and interests. And they can serve as informed guides in choosing further musical study. Parent participation in the program also allows reinforcement of concepts and skill-building at home. Parents see how the concepts are presented, and learn how to reinforce the ideas at home. Parent help during the classes is critical to the program; young children need guidance to find pages and someone to point during the rhythm ensembles. Also, the presence of a parent provides stability and security for the child, for whom this may be the first structured experience.